Marriage loses its softness or tenderness when couples expect more than appreciate — and I’m using the word in its broadest sense. Say “thanks” more often, and it’s a big step in the right direction, but real appreciation is more than that. It’s an overall awareness: a focus on a person’s assets and contributions, rather than their deficits. It’s about what they do do, rather than what they don’t do. Appreciation looks deep into our loved one’s heart; for how can we say we really know our partner, let alone love them, if we do not appreciate them? That’s the big conundrum in The Shop Around the Corner, one of my favorite Christmas classics. In the 1940 version of this sweet story, Jimmy Stewart and Margaret Sullavan play Budapest store clerks who are forever butting heads. (Tom Hanks and Meg Ryan played competing bookstore owners in the 1998 version, You’ve Got Mail.) The two are constantly disagreeing, criticizing each other at every opportunity, all the while unaware that they are actually… truthfully…secretly… adoring pen-pals! Lovers by letter? Antagonists in person? How is such irony possible? For months, in their daily interactions as clerks, Mr. Kralik and Miss Novak choose to see one another in the worst possible light, every little thing filtered through the lens of pride and offense. In their regular interactions by letter, however, the couple chooses to see one another in the best possible light. Which relationship will triumph?… If you haven’t seen the film (and you should), I’ll give you a hint: It’s the one, the only one, that can lead to happily ever after. Leave a comment on this post to be entered in The Fifth Annual Classic Hollywood Christmas Giveaway! All thoughtful commenters on this blog between now and 11:59m PST December 31st, 2018, will be entered in a RANDOM.ORG drawing for one of FOUR Hollywood Christmas classics on DVD (including It’s a Wonderful Life) as well as an autographed copy of Wife for Life: The Power to Succeed in Marriage. Each comment (one per post please) will count as an entry. Come back and comment on all the Hollywood Christmas Classics blog posts (published Wednesdays in December) to better your chances! It’s something that’s so simple, but takes so much focus -especially in a world that loves to view things through a critical lense. But there is SO much that is there to appreciate, I know I have to make the choice to recognize it and make my appreciation known! And there can NEVER be too much appreciation! This is my hubby’s favorite movie. I, too, have to make a focused effort to show appreciation. Things always go more smoothly when I do. I love both movies Deborah, but The Shop Around the Corner is a real classic – in every sense of the word. I promise you’ll love it. I saw a stage production of ‘Shop Around the Corner’ last year and loved it! It’s almost painful to watch each of them at the moment of realization. I imagine they are replaying in their minds all of the terrible things they’ve done and said to each other without knowing their true feelings toward one another. It reminds me of the pain I feel when I look back (sometimes not too far back) at the way I’ve treated the person I love the most in this world- my husband. And I promise myself that I’ll try to always remember my true feelings toward him in the future. I think that’s why I love the movie too, Lacy. It hurts in a helpful way! When others expect the worst of you, it often makes you want to show them just how horrible you can be. When they see and appreciate how much you’re trying to do good, it makes you want to prove them right. It’s the whole self fulfilling prophecy thing. Why not give the men in our lives another reason to reach their potential… By showing them appreciation for how far they’ve already come? Oh my goodness! I love old movies and this is one of my favorites! I also enjoy the musical version, In the Good Old Summertime with Judy Garland and Van Johnson. I can really relate to what you are highlighting here. Like the leading lady, I have a tendency to keep all my positive thoughts and feelings inside, private and personal, but I broadcast the negative freely. I am working on reversing that. It is not honest and it is an obstacle to getting what I really want. Thank you for this fantastic reminder! It must be time to watch this one again! The story is a bit like Beauty and the Beast. I just had a major epiphany? 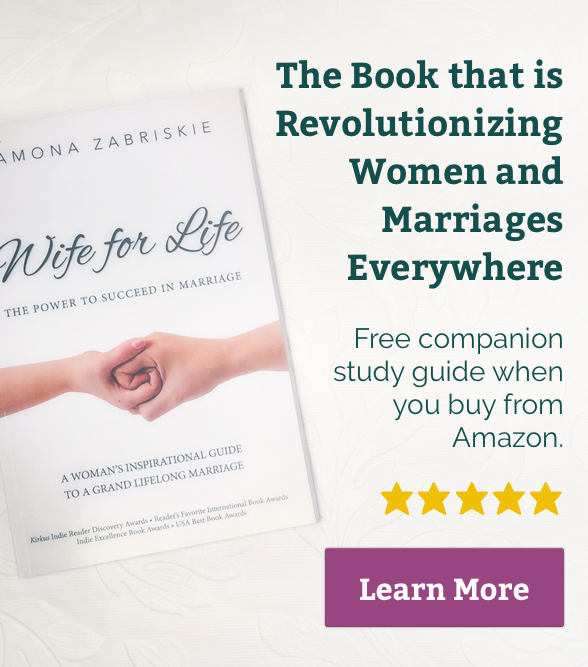 What if we treated our husband as an answer to prayer and sought to be his answer to prayer? We can be even more than friends! Now I can’t wait to watch the movie! I’ve never even heard of this movie but Jimmy Stewart and Christmas go together like December and snow. I have found great satisfaction in learning how to work through differences with my husband. Our default is to not discuss disagreements at all rather than fight – which isn’t healthy either. When we have a constructive, respectful discussion about our perspectives and needs I always end up feeling so encouraged and in love with my man! Laura, I’m so glad you’ve learned the value in talking things through in the language of respect. 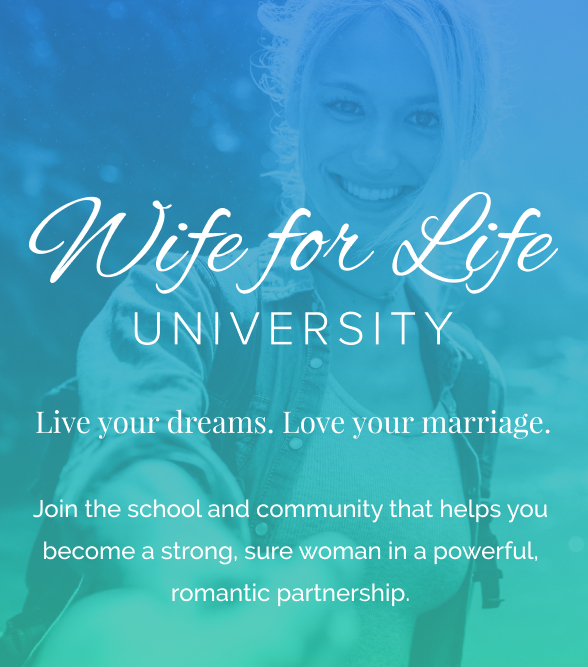 We learn a skill set in Wife for Life University (also in the book, Wife for Life), that Prevents Conflict as much as possible, Protects the Relationship during inevitable and natural conflict, and Perseveres despite unresolvable conflict. It is a critical key, or skill set to develop, if you want a marriage that not only survives but thrives over the long haul! And YES! Watch the movie! I love “Shop Around the Corner”! Jenny, you do????? Most people know “You’ve Got Mail” of course (which I love too), but I’m always partial to the original rather than a remake. Even Tom doesn’t beat Jimmy! Ooh, how I adore Shop Around the Corner! I’ve always thought it interesting and sad that they chose to see the worst in each other. That’s sure to hurt any relationship! BUT how delightful when Mr Kralic finds out that Miss Novak is the very woman he sees the best in and is who he is HIS best for (in their letter exchanges). From that point, he’s more gentle and kind with her in person. It softens her heart, and soon you have one of the most beautiful endings in a film every made. What powerful proof that if even ONE partner can have more gentleness and kindness in the relationship, in can affect the overall relationship! Catherine! What a good point — one I should have made myself! You’re right! He figures out her real identity long before she figures out his, and he tries so hard to change her perspective without coming right out and identifying himself. Her barbs hurt all the more though, when his “appreciation” is not returned — BUT (and here’s the lesson): instead of getting offended and returning her barbs, he continues to believe in the “real” or best her. His consistently gentle approach eventually wins the day and her heart! THERE IT IS! Profound. Thank you for bringing that incredibly important aspect of this lesson to light! Even applying the smallest of tips from you, Ramona, makes a big difference in my marriage. “Out of small and simple things are great things brought to pass.” Thanks for helping me learn a better way! Debbie, I love how you say “a better way”. We actually used to use that by-line for Wife for Life University: “a better way to succeed in marriage” because it IS! Thank you for letting me know my work is helping. I need that kind of feedback to keep up my momentum. It means a lot. We can do this together! What a wonderful reminder during the holiday season when emotions run high! I think gratitude is such a great defense against pride and selfishness, it makes our hearts swell with love instead! Really love this relating movies to marriage! Thank you for your insight and encouragement! Thank YOU Tobi, for taking the time to say so. That means a lot to me. Like the three year old boy, I was also accused of saying “thank you” too much. The interesting thing was that the person accusing me overheard me saying it to my husband. It had become a good habit as you said and I wouldn’t give it up for the world. Can’t wait to watch The Shop Around the Corner and it’s happily ever after. Jennifer! I always tell the doubters, skeptics, and slow-adopters about “thank you’s” that “appreciation celebrates what you want more of”. 🙂 How true is that. Nothing motivates a person as much as being appreciated. Such a simple thing to do to! It’s impressive you’ve been accused of doing it too well! It sounds so simple and yet can be so hard. My heart wishes that my husband would notice the things I do more often. I’m sure his wishes the same. I’m going to ask for some divine intervention in this very human heart to give me guidance and nudges to say thank you more often in my home. Oh Laurie! You speak for us all when you say it would be so nice to be more appreciated ourselves! But, I’m sure you speak for husbands when you say, “I’m sure he wishes the same”. It’s my experience, both personal and professional, that juicing up your own appreciation quotient, eventually sparks increased awareness in him. Test me out on that! Thank you for this movie recommendation. I like how you put your own ‘Wife for Life’ spin on it! While I have seen the remake, I don’t recall ever seeing the original movie, “The Shop Around the Corner.” I will have to look for it. Yes, Lacy, do~! And let me know what you think! I think this is something everyone struggles with at one point in their lives. I know for me, right now it has been a struggle with my husband busy with his final year of grad school and me pregnant with our third child. I have to constantly remind myself to think about the things are getting done and not the things that aren’t. I have never seen The Shop Around the Corner, but now I want to see if I can find it at the library. I loved You’ve Got Mail, but the original should be better, especially if it has Jimmy Stewart. 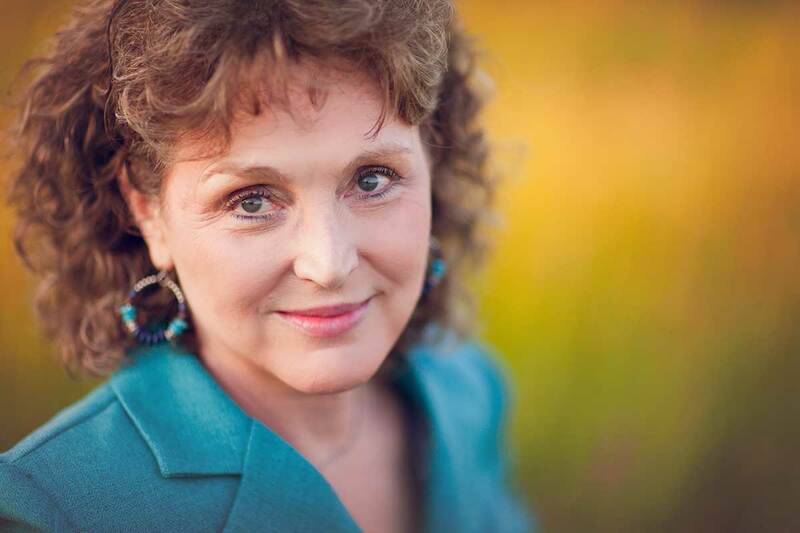 Anne Marie, you are so right about stressful times: those are often the times when we’re actually getting the most done, but ironically, can’t see it through all the stress. You’re doing amazing things getting through grad school and starting a family at the same time. Patience and appreciation will definitely help smooth the way and protect you both from hurting each other during the process. I love these movie comparisons! I never thought to look at this story in that light–but you are totally right, it’s about perspective! Appreciation vs skepticism/negativity. Always love your emails. Thank you so much for your encouragement! This is so fun to dissect movies! I love it. I’d like to think that I am always saying thank you to my husband and appreciating all that he does for us, yet I really liked what you said, “a focus on a person’s assets”! I love that. We are focusing on the good, thus making less time (and takes over) to focus on things that may be lacking. Plus we are all happier in the end, progressing as a team, empowered together because we know that what we are doing is recognized and appreciated. Love this! Was intending to delete and move on, but your insight and great wording pulled me in to read on, and even come to this comment area…kudos for helpful work well done! and Thank You! That’s kind Valerie! Thank YOU! I think it is so funny that people are sometimes looked down upon for being “too” kind (such as saying “thank you” too much). I have never been in a situation that a little kindness didn’t improve. I am so grateful to have a husband who looks for the best in me and I hope that I will always do the same for him. Sounds like you are a blessed woman, who I’m SURE has a husband who appreciates the way you appreciate HIM! My husband and I have joked that “You’ve Got Mail” should be part of our family history, because we initially met online through an AOL similar interest chat group. We met in person as friends before anything, but since we lived about 3 hours apart, the dial up and “You’ve got mail!” brings back sooo many memories. Online meeting to marriage ease so new, we were front page news in two newspapers. 🙂 I love this additional lesson from this movie. It adds another importance for me, because I know I swing between both relationships and need to appreciate far more. I need to read further in your book! Thank you! You are making me smile Marni! Front page news??? You’d might be that now for making such a go of it all these years! I hope you DO read the book! Thank you Mona for this important reminder. I am already looking for a time to watch this movie. I can’t believe I haven’t seen this one yet. This week! This was my trouble! I was seeing the faults and irritations and not the many things there were to appreciate. It’s lovely to be in a place where giving each other the benefit of the doubt and looking for the positive is our new default. Yes, Alayna! You’ve come a long way and are so much happier! Well done! I have seen a stage production based on this and loved it! I admit I think I do this perhaps more than I actually do; especially with those who have the same problem towards me. It is a good reminder to be more mindful and look for the good. I’ve never seen this! But now I must! More appreciation is going to be my gift to my husband (and to myself) this Christmas. I LOVE the older movies! Their messages are so applicable! Thank you for your thoughtful articles, Ramona! I’m very much looking forward to attending W4LU in the future!! I’m the meantime the articles really remind me to be mindful in my relationships, especially my marriage. So thank you for sharing your wisdom with us. Thank you dearest Ramona for recommending these Best Imagination movies! I’m making a list of them to make sure to watch them. I like your W4L take away of them. They are such great reinforcements of these principles. Love much. Thank YOU dear Farinaz! That’s exactly what “Best Imagination” prompts are meant to do — reinforce W4L principles. Hope you are having a wonderful holiday season. I’m not sure that I’ve ever seen The Shop Around the Corner, but I really have to add it to my viewing list. Besides the value of appreciation, your post speaks to how easy it is to fall into the pattern of seeing only what we expect to—which works well when we expect goodness, but not so well when we expect the worst from someone. Whatever we focus on seems to multiply, and I need to shift back into remembering all that I appreciate about my husband when I start feeling overwhelmed and stressed. So true, Kristin! And our stress IS lifted significantly with just this shift in perspective. Appreciation blesses not only those who receive it, but those who GIVE it! Wow! Getting philosophical Stacia, but you’re absolutely right in my book (literally!). Love it. I have never seen this movie! I have, however, seen You’ve Got Mail, so I have a bit of an idea of what you are talking about here. Recently my kids were watching a tv series on Netflix called, Brain Games. In their second episode they show the tv screen with 4 footballs, one in each corner of a box, and ask the viewer to pick one football and focus only on that one. Next thing you know, all the other footballs fade away, and all you see is the one football. The narrator then says that they have not done anything to the screen, but that our brains naturally stop seeing those things upon which we are not focused! I have pondered on that a lot the last couple weeks! It is so true! What we choose to focus on will become more clear, while the rest fades away! I love your insights on these movies, and now I have started a list of Christmas movies to watch, and re-watch! Thank you! Thank you, Melissa, for sharing the “brain science” behind this phenomenon in our relationships and life in general! I appreciate you Ramona! I have never seen any of these films so I would love to win one! I don’t think I have ever heard of this movie. However, I have enjoyed watching “you’ve got mail.” I am enjoying the lessons you are writing about through these movies. I like movies that I can learn from…and enjoy @ the same time. I love this reminder to see my husband in the best light, just as I want to be seen.